As an artist who has showcased my work to the public, I have been approached by a number of admirers and examiners of my work on a regular basis, who have a variety of feedback to provide. It is never easy to receive criticism, of course, but we can learn more from the negative than we do from the positive. Other comments are yet more of a reflection of the observer than the observed. The three statements I have heard most as an artist are: "Wow, I can't even draw a straight line," "I can do that myself," and my personal favorite, "I can get that at (insert your favorite department store in bad need of a dress code for its patrons.)" I plan to discuss the first two people today, and allow the third to go shopping elsewhere for the time being. My answer to both people is yes, you can! 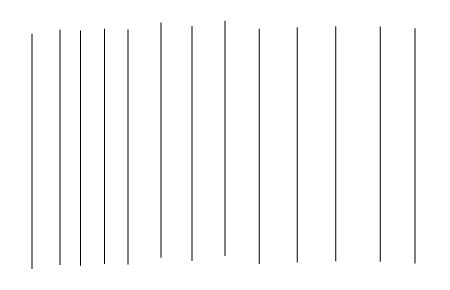 Ok, perhaps if you want a perfectly straight line, you ought to use a ruler. I need a ruler to make a straight line as well. (Fig. 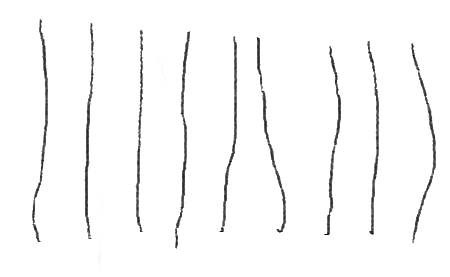 1) The beauty in art is that the line appears to be straight when it is in fact not straight. (Fig. 2) Maybe you are not able to create what I create. Maybe when you try to make jewelry, all you end up with is a great big mess of melted silver. However, you may be able to knit, or sew, or sing like an angel. I tried many different crafts and art forms until I found a certain few that simply worked for me. I will tell you, knitting was a disaster, and people should pay me to stop singing. However, until we try something, we will never know what we are good at. We also are not always going to be good at something the first time we try. There is the old adage of beginner's luck, but the truth is we are always perfecting our craft. If it always came out perfect the first time and every time, the craft would become dull to the artist and craftsman. Our purpose is to do it better each and every time. We do not necessarily enjoy sharing our disasters, but those mistakes were valuable learning tools. They show us what not to do or repeat. In our strive for perfection, we do not like to admit our failures, but perhaps it is necessary for them to be seen to help others be more confident in their own learning process. I created the above ring in 2006. 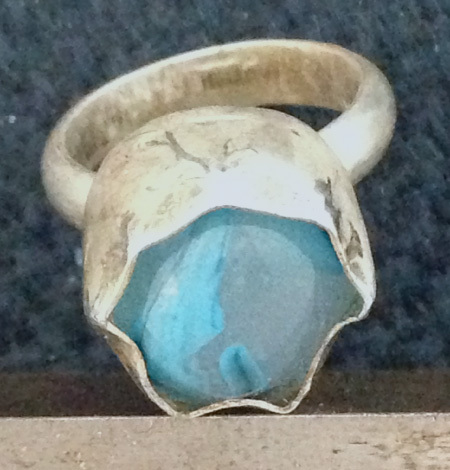 It was not the first ring I ever made with a stone setting. It is perhaps not the most disastrous mistake I have made, either. It was, however, perhaps a dumb mistake. I measured the bezel wire too high (I actually do not think I measured it at all!) and was unable to push the wire over the surface of my cabochon. 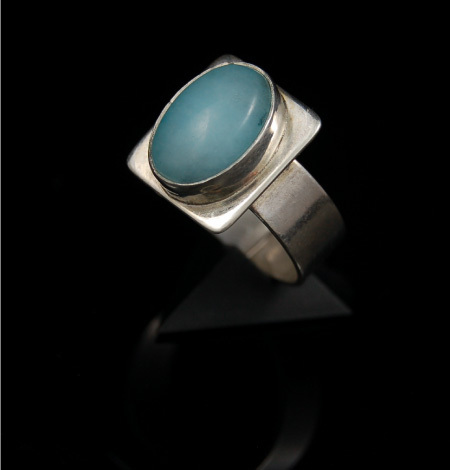 Had I been able to push the silver wire, you probably would not even be able to see the cabochon. I am certainly not proud of this work. One of the beauties of silver, however, is you can melt down your mistakes and start all over, which I certainly have done before. I have chosen to keep this piece as it is currently, and I keep it on my work bench as proof of how I have grown and improved over the years. I know full well this is not an error I would make today, and it helps me grow beyond myself and remain confident in what I am doing. The ring also reminds me that we are not good at everything we set out to do. The cabochon in the center is my attempt to learn lampwork beading, a skill I have utmost respect for. Nothing horrid happened when I tried my hand at this, and with more practice I may have become proficient. There was no pleasure in making the bead and I gritted my teeth the entire time. Regardless of whether you are capable of making a lampwork bead or drawing a straight line, if you do not enjoy doing it, there is no shame in enjoying others who can. When we do enjoy an art or a craft, beautiful creations will come forth from our very own two hands. The more we practice the better we will become. We are merely human, and our work will never be perfect, but we will always strive to be better than we were. So, if you think you cannot even draw a straight line, try it before you give up on yourself! If you think you can do something, what are you waiting for! I love that you kept that ring as a reminder, Lynn! I'm such a perfectionist, and I hate being bad at things. When I first started doing jewelry metalsmithing, I actually dreaded going to my class because I felt I was so bad at it. But I kept going, and slowly over time I got to to the point where I actually know what I am doing. I think though many of us have certain crafts were are naturally inclined toward, it takes time and patience to really build up those skills. Wonderful post!